Could't you send me the hotel phone/fax number? When do I have to include my credit card number? A- In the Page of the selected property, you can directly control the room availability, typing in the arrival and the departure date (Look Picture 1). Picture 1 - Hotel description page. 1- Please type the arrival and the departure date, then click on the Check Availability. B- In this Page, the list of the available room for the requested date, will be visualized. (Look Picture 2). 1- Price for a one room for a night. 2- Display Rates: It is the Price-list of the properties. 3- Exchange Rate: It's the exchange rate of the room price. 4- To go on with the reservation, select room type and click on "Book". *In case if there is not available room for the requested dates, the "Agent Key" Secure Software suggests you a list of structures with available room. C- In this page, the first dates are requested in order to go on with the reservation (Look Picture. 3). 2- The Number of the adults and/or the children for each room: please type the number of people per room. 4- Cancellation Policy: "Very Important" Before going on with the reservation, read carefully the Cancellation Policy. 5- Display Rates: It's the Price List of the property. 6- Exchange Rate: It's the Exchange Rate of the Room Price. 7- Another Room: Click here only in order to make a new reservation for another room. 8- After reading and typing the necessary data, you can go on with the reservations, Click on "Continue Reservation". D- In this Page provide the personal data and the credit card details. (Look Picture 3). 1- Page Area that shows the previous choises of the customer (hotel, room type, arrival and departure date and the total price). 2- Page Area where the customer provides all the personal Data. 3- Page Area where to type the Credit Card Details. "Confirm by Fax" In case if You do not want to provide your credit card details you can choose to send these details by Fax. 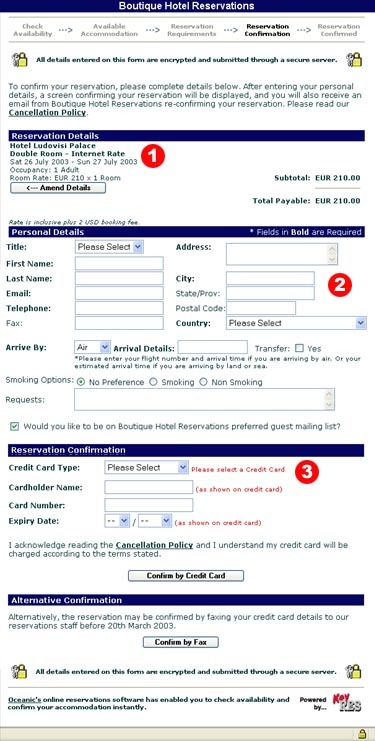 After typing all the necessary data, including the credit card details, your reservation will be registered in the "Agent Key" Secure Software, and an E-mail will be sent to you by confirming your reservation with a relative confirmation Number.